Open Office Excel worksheet, and then go to “Insert” tab and click on “Object” option to insert an embedded object. Next, a dialog window will pop up with two tabs which name “Create New” and “Create from File”. Click “Create from File” tab and browse for the selected file to insert into the Excel worksheet. 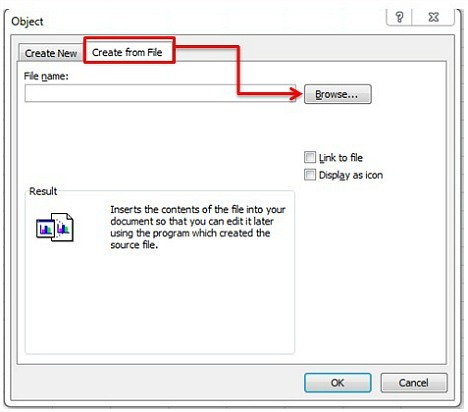 There are two options available when insert a file into Excel – Link to file or Display as icon. You may just tick on one of the check box for the option you preferred. If no box been selected, file content will be displayed. Link to file: Insert the contents of the file into the document and create a link to the original source file. Display as icon: Insert an icon that represents the content of the file into your worksheet. If selected Display as icon option. 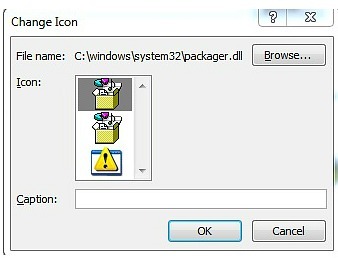 Click on “Change Icon” to change the Caption Text and the icon for the inserted file. Click “OK” once done. 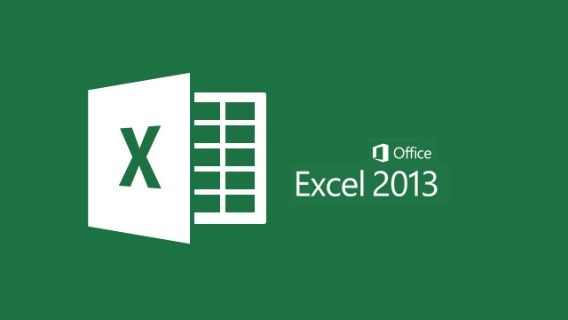 A file will be inserted into the Excel worksheet with display as icon.